Before considering what additional reforms are needed to fix a severely broken criminal justice system, U.S. elected leaders must first stop supporting the very mechanisms that caused the failure in the first place. Borrowing from the field of medicine, lawmakers must embrace the notion of “first, do no harm”—or more accurately, “do no more harm.”9 This issue brief spotlights four problematic tough-on-crime policies exacerbated by the crime bill that remain in place and continue to undermine reform efforts. Only when these destructive policies are reversed can the rebuilding of the criminal justice system truly take root to prevent harm in the future. Shifting away from the infrastructure created by the crime bill is not easy, especially because much of the American public equates public safety with policing, prosecutors, and prisons and jails. Polling shows that despite significant drops in the crime rate, the majority of the general public believes that crime has gotten worse.10 When the public feels tense about their safety, the solution they seek is often more police officers, more convictions, and longer sentences. When tensions diminish or crime rates decrease, mayors or governors proudly stand at a podium with law enforcement to boast of the achievement. Not surprisingly, the footprint of policing has expanded dramatically in recent years. The default solution is to call on law enforcement to respond to any issue that has the potential to affect a community’s safety—whether it is substance misuse and addiction, mental health issues, truancy, or homelessness. In almost every situation, law enforcement’s main tool is the power to arrest and incarcerate, thereby unnecessarily enlarging the criminal justice system simply because other solutions or responses are unavailable. Requiring the law enforcement apparatus to solve societal issues that it is neither trained nor equipped to handle overburdens the justice system and prevents it from properly executing its limited core responsibilities. That same type of transformation must happen with America’s approach to public safety. The criminal justice system can be likened to hospitalization or a surgical intervention, which is never removed as an option but is reserved for the most serious situations. Unnecessary arrests and incarcerations, like surgeries, run the risk of serious complications.14 Even when invasive interventions are necessary, care must always be taken during the procedure to minimize trauma and promote a quick recovery. But the overall goal and the bulk of resources should be devoted to keeping people out of the operating room or, in this case, out of the criminal justice system in the first place. Unfortunately, the United States’ investments in public safety continue to overwhelmingly prioritize arrests and incarceration over measures that prevent crime from occurring. As elected leaders reflect on the 1994 crime bill, it is not enough to state that the country is learning lessons from the bill’s failings. Instead, elected leaders must take concrete action to halt the very mechanisms that the legislation created—and that continue to undercut meaningful criminal justice reform. Even the 1994 crime bill included a section devoted to crime prevention activities.15 But in the end, many of these programs were either repealed or never received any funding in the first place.16 Going forward, leaders must make the following commitments to stopping the ongoing harm inflicted by the 1994 crime bill. Any serious effort to halt the ongoing damage wrought by the crime bill must target the money—the law’s primary vehicle for influencing state and local policy. Every year, the U.S. Department of Justice (DOJ) distributes millions of dollars to states and localities through funding grants started under the crime bill—the vast majority of which is funneled directly to law enforcement agencies with few strings attached.17 The single largest source of federal public safety funding today is the Edward Byrne Memorial Justice Assistance Grant (JAG) Program, which has its roots in a massive mid-1990s block grant for local law enforcement agencies.18 Cities and states can use JAG to support a wide array of public safety functions—from violence prevention to indigent defense to mental health treatment.19 The reality, however, is that most JAG funds go directly to law enforcement. JAG and other public safety dollars from the federal government cannot continue to be structured in a way that results in the vast majority of the funds going to support law enforcement. The federal government must intentionally invest in a new vision for stronger, healthier communities and no longer simply distribute money to states with the hope that they spend it appropriately. This can be accomplished in part by requiring states to devote substantial percentages of JAG funds to areas besides law enforcement in order to ensure a comprehensive approach to public safety. Additionally, Congress could change the eligibility formula for receiving JAG funds so that it is based not only on population and annual crime rate data, but also on other indicators of community well-being such as measures of poverty, unemployment, and educational attainment rates. 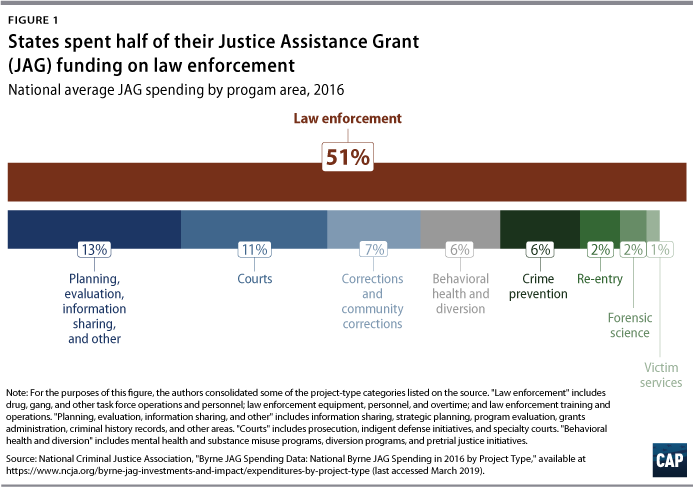 Congress could also substantially increase the amounts that it appropriates to JAG—but only if that escalation is set aside for purpose areas that are perpetually underfunded by public safety dollars such as crime prevention and mental health and substance abuse treatment. Through a radical realignment of DOJ’s investments, lawmakers can reinvest billions of dollars into communities and effectively reshape the way that jurisdictions think about and carry out public safety efforts. Elected leaders should not add to the already cluttered criminal code. At the very least, they must substantially raise the bar that must be met to consider new crimes and criminal penalties. Current and future presidents should issue veto threats, making it clear that they will not sign any bill that increases criminal penalties or creates a new crime unless there is clear evidence that such a measure is not only necessary, but also that no other noncriminal justice solution could achieve the same result. Congress can pass a rule that requires a supermajority to pass any legislation that increases a criminal penalty or adds a new offense to the federal criminal code. Additionally, Congress should be required to produce data on who a new criminal statute or penalty would affect to ensure that it does not disproportionately criminalize people of color or other vulnerable communities. 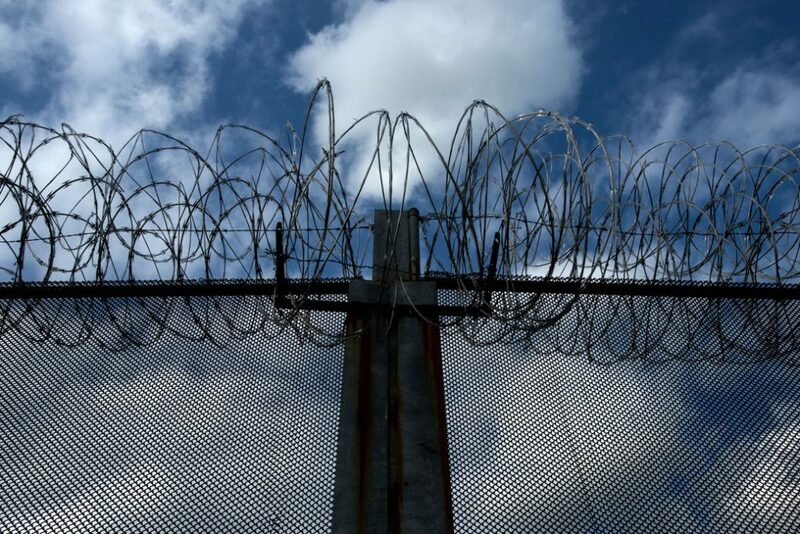 The lifelong consequences of incarceration and criminal records on people and their families are too harmful for lawmakers not to carefully consider whether a criminal statute is necessary. While DOJ’s original truth-in-sentencing incentive program has lapsed, the federal government continues to subsidize the growth of correctional facilities. Most notably, the U.S. Department of Agriculture has spent $360 million to build jails in rural communities, using funds from a grant and loan program that was originally intended for rural economic development and infrastructure improvements.35 The Trump administration has approved approximately $106 million of this amount.36 These facilities are especially unnecessary today, considering the United States’ current low crime rates, yet jurisdictions see an opportunity to create jobs through the criminal justice system. More insidious, the construction of new prisons and jails dangerously compels governments to make use of them, thereby creating a self-fulfilling prophecy of criminalization. This vicious cycle must stop—starting with policymakers ending funding, resources, and incentives to build new jails and prisons. Private prisons, however, are just a sliver of the for-profit criminal justice industry. Private industry has permeated virtually every sector of criminal justice operations. Every year, bail bondsmen collect $1.4 billion in nonrefundable fees from defendants and their families; private vendors earn $1.6 billion selling goods in prison commissaries; and telephone companies collect $1.3 billion in exorbitant fees for calls from prisoners to loved ones and lawyers.42 Furthermore, private industry is undermining efforts to reduce reliance on incarceration by monetizing the use of community supervision. A private electronic monitoring company in California, for example, collects more than $750 in monthly fees from every individual on supervision who wears a monitoring device.43 This model not only expands the scope of mass supervision, but it is also designed to keep people trapped in a cycle of justice involvement. Anyone who is unable to afford the steep costs of electronic monitoring can expect to end up in jail, regardless of the nature of their alleged offense. As long as the criminal justice system is motivated by profit, it will continue to expand its reach and inflict undue harm on individuals and communities. Elected officials must immediately end the use of profit-motivated vendors that have been allowed to dictate justice policy for too long. By severing the link between criminalization and profit, lawmakers can accelerate efforts to drastically reduce overall incarceration and supervision rates. The 1994 crime bill systematized so-called tough-on-crime policies in the United States. Efforts to reform the criminal justice system, therefore, will always be labeled a first step until lawmakers embrace the concept of “first, do no more harm” and dismantle the instruments that actualize these policies. They must commit to investing in comprehensive public safety solutions; dramatically reducing reliance on incarceration; preventing unnecessary criminalization; and breaking the link between profit and the criminal justice system. Ed Chung is the vice president for Criminal Justice Reform at the Center for American Progress. Betsy Pearl is a senior policy analyst for Criminal Justice Reform at the Center. Lea Hunter is a research assistant for Criminal Justice Reform at the Center.